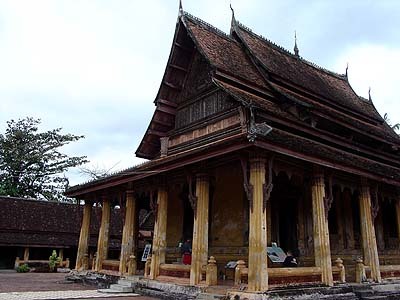 Wat Siskaket (Wat Sisaketsata Sahatsaham) was built by King Anouvong in 1818, the Siamese style perhaps saved it from the destruction that came with the Siamese armies in 1828. It is located near the Presidential Palace. A restoration took place in 1935. There is inside the Buddha images ( 6840 images ) from the 16th to the 19th century. The grounds are richly planted with a variety of vegetation that is lovingly tended, so it becomes a restful retreat as well.